We're very lucky to own both a huge freezer and a medium freezer, which makes our food operations much more efficient. In the summer as we become overwhelmed by vegetables, we start to fill up the small freezer. 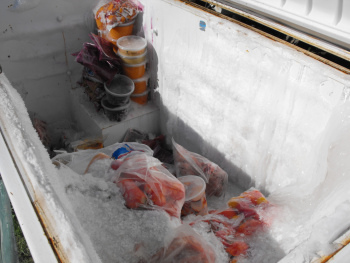 By late summer, the small freezer is chock full, so we unplug it, plug in the big freezer, and transfer our wealth over. And we keep freezing more produce, of course, until the big one is mostly full. 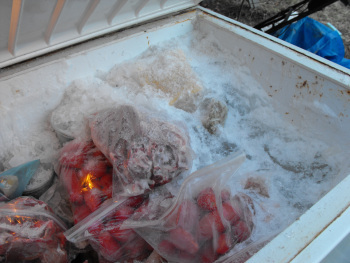 As the big freezer begins to empty out in the spring, we transfer everything back to the small freezer. This year and last, by freezer transfer time, I've realized that I froze too much of certain types of food, so I gave them away. It's a good feeling to be able to fill your mother and brother's freezers, then give them some extra to pass on to their fixed income friends. My goal is to have the freezer pretty much empty by the time new food starts to go in. The exception is meats --- we don't yet slaughter many of our own animals, but Mark always keeps his eye on the last-chance-meat-aisle at the grocery store, and when good meat is being sold cheap he buys it all up and we toss it in the freezer. As a result, we pretty much never pay full price for meat. I hope that in a few years we'll be hunting and/or raising most of our meat, but for now the last-chance-meats fit our budget. My last piece of freezer advice pertains to what I call the Berry Syndrome. Nearly everyone I know succumbs to this --- I suffer from it too. You freeze a pint or a quart or a gallon of those delicious summer berries (or sun-dried tomatoes, or whatever else is delicious and in short supply), then you save it for a special occasion. By freezer cleaning time, it's still there! Don't fall into the Berry Syndrome trap --- decide that today is a special day and thaw those berries out!